Your spine is designed with flexibility in mind. However, the tissues, bones, joints, and nerves that support it can still be affected by your preferred activities. If skateboarding happens to be part of your regular routine, your spine and large muscle groups that provide stability will likely be stressed from falls, twists, and turns and the motions necessary to maintain balance while on your board. Since most skateboarders make the same basic movements, there are some common lower back injuries associated with skateboarding. Most skateboarding injuries occur on ramps. Only about 12 percent occur on streets. 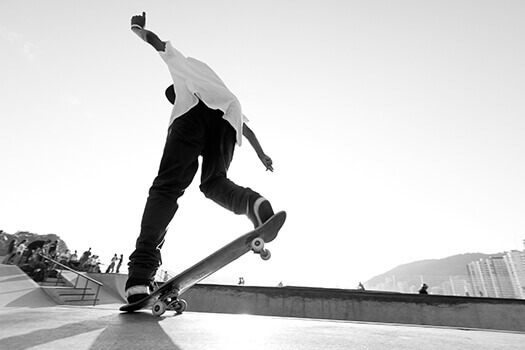 Loss of balance is the most common cause of injury while on a skateboard, followed by failed attempts to do tricks. Falls caused by surface irregularities often result in moderate injuries. Typically, injuries on ramps or while attempting tricks are more severe. Low back pain due to strained muscles often responds well to the RICE (rest, ice, compression, and elevation) method. This means resting for a few days, applying ice to the affected area, compressing the area to reduce swelling with an elastic bandage, and elevating the injured or sore area when sitting down to increase circulation and minimize swelling. Reduce your risk of skateboarding-related lower back pain by paying attention to your posture and technique while on your board. Skateboarders who are inexperienced and those who don’t wear proper protective gear tend to have the most injuries. Avoiding falls and excessive twists as much as possible may be equally helpful. When you’re not on your board, do stretches and exercises to strengthen the muscles around your spine. Partial sit-ups, pelvic tilts, and knee-to-chest stretches are among the exercises that may help you achieve this goal. Whether your back pain is caused by a skateboarding injury or some other source, it’s important to take measures to treat it, which may involve some form of minimally invasive surgery. At The Spine Institute, we specialize in many different fusion and non-fusion procedures, from artificial disc replacement to laminectomy surgery. Beverly Hills residents who want to effectively alleviate their chronic pain should call our office today at 310-828-7757 to schedule an appointment.